Love’s SFDP offers free legal services for all qualifying immigrants who come to the United States. Specifically, the team works to represent transgender migrants detained by U.S. Immigration and Customs Enforcement (ICE). Transgender migrants detained by ICE, are typically transported to one of just a few detention centers with a “transgender pod,” like the Cibola County Correctional Center, a privately-owned prison in Milan, New Mexico. Transgender asylum seeker Roxsana Hernandez was detained at Cibola before she was hospitalized and died a week later, after suffering from dehydration and H.I.V.-related complications, according to an independent autopsy. The SFDP works in this facility frequently. Last year, Love met a group of trans women in Puebla, Mexico, who were a part of a caravan that arrived in early May. When these women arrived at the border, the entire group presented themselves for political asylum and were detained. They were then transported to Cibola County. But before they got there, the first interaction between the team of immigration lawyers and the caravan happened in Oaxaca, not at the border. It began as a group of about 30 women (which swelled to 51 by the time they reached the U.S. border), mostly from Honduras, ranging in age from 16 to 36. Love’s team, along with several individual volunteers and national organizations, immediately began recruiting sponsor homes, collecting resources to donate to the women upon their release, and compiling evidence to display that the women were not a flight risk or a threat to national security. Lawyers from the Western Massachusetts ACLU drafted their parole applications, and all but one of the women were released in July. The woman who remained at Cibola is the only member of this cohort to have since been granted asylum. Legal efforts like this are a part of a concerted effort by the broader LGBTQ+ and immigrant advocacy communities to get trans migrants out of detention. That’s because, in part, trans detention is dangerous. In a survey of trans people placed in immigrant detention, 45 percent of respondents reported being physically or sexually assaulted, threatened with sexual assault, or denied access to hormones or gender-appropriate clothing. Areli — one of the trans women from the caravan detained at Cibola County — said on SFDP’s website, that her detention felt hopeless until she was free. Lazarus Letcher, a Ph.D. student in American studies at the University of New Mexico, has helped organize support for immigrant trans women released from Cibola. Each woman released is given food, clothing, toiletries, transportation, and a place to stay thanks to a community of supporters, Letcher pointed out. The SFDP is currently working to repeat the entire process to free a number of trans women who arrived in the last caravan in early December 2018, but they’re being met with some challenges. According to Love, one of the most frustrating processes surrounding the current treatment of asylum seekers in the United States is that migrants are being unnecessarily, and even unlawfully, criminalized. Beyond the flippant criminalization of migrants by the American immigration system, however, asylum seekers face danger before they even reach the United States. Amnesty International lists both Mexico and Honduras as two of the top seven discriminatory countries for LGBTQ+ people. Lynly Egyes, director of litigation for Transgender Law Center, says trans asylum seekers have reported experiencing discrimination, outright refusal for shelter and even terrorist threats in the Northern Triangle countries of Guatemala, Honduras, and El Salvador. The U.S. government's policies can exacerbate these dangers. Bureaucratic gridlock causes migrants to become “sitting ducks” in border towns. In January the Trump administration updated these protocols, potentially putting some vulnerable migrants in heightened danger. Under the most recent update to the Migration Protection Protocols, asylum-seeking migrants detained at the San Ysidro port of entry will be given a court date in the U.S., and returned to Mexico for up to a year until that scheduled date. This may actually be illegal, and at the very least potentially harmful for LGBTQ+ migrants who are being left stranded in dangerous cities. Luis Mancheno, a Latinx immigrant, immigration lawyer, writer and activist for immigrants' rights, confirmed the dangers of stagnancy along the U.S.-Mexico border. 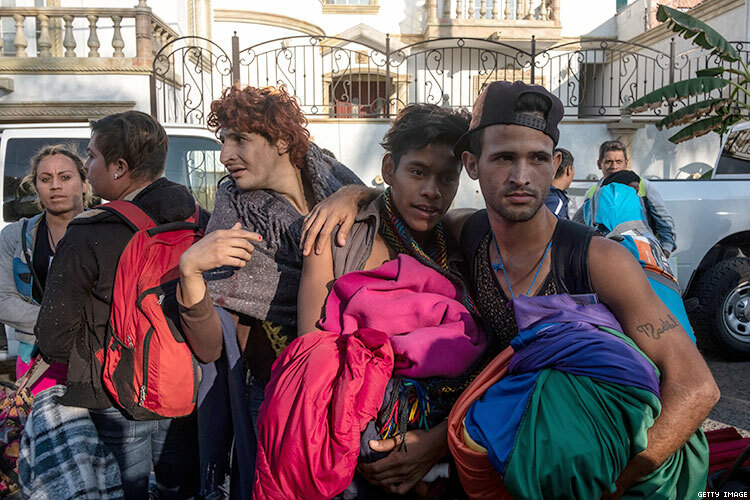 “What this means for LGBTQ asylum seekers in particular is that they remain vulnerable while they wait in Mexico to many of the dangers they faced in their places of origin — including blatant discrimination, sexual, physical, and psychological abuse, and lack of government protection when they are targeted due to their identity,” Mancheno told Out. In 2017, a shelter in Mexico housing LGBTQ+ migrants was burned down, and some queer travelers have reported being targeted by members of their own caravan. In November, for example, members of an LGBTQ caravan that had just arrived in Tijuana told INTO they’d been harassed traveling with straight migrants who said things like, “Stop pretending you are a woman.” Queer people in Mexico have also faced oppression from the police. Hardships for migrants are seemingly unending. After traveling across Central or South America, arriving in the U.S., and then being detained and released by ICE, migrants are left without any legal option for employment or a way to earn a living. Over 300,000 immigrants who live in the U.S. are not detained, but cannot yet work legally in the U.S. They are not guaranteed any sort of legal representation to navigate the complicated legal process that they will have to go through, according to Scott Hechinger, senior staff attorney, and director of policy at Brooklyn Defender Services. “These are people who have already survived so much. They escaped violence and looked to the U.S. for safety, but instead were detained and in far too many cases, separated from loved ones at the border,” Hechinger told Out. “While they wait for work authorization, many immigrants do not have enough food or money for rent, transportation, or healthcare. Their struggle to survive continues." Brooklyn Defender Services recently launched the “While They Wait” campaign with RAICES and the ACLU of Southern California, alongside artists Miguel, Calvin Harris, and Benny Blanco. The campaign provides support for immigrants living in the U.S. who are waiting for political asylum or other legal statuses. For hyper-marginalized groups like queer migrants, the support of everyday volunteers and trained professionals is life-changing. Many queer migrants have never had anyone truly be on their team. TIM HARRIS is a bi, Albuquerque-based student, writer and multimedia journalist. This story was corrected to clarify Roxsana Hernandez's location at the time of her death.